After yesterdays big day I woke up pretty late so only had the afternoon for some climbing. 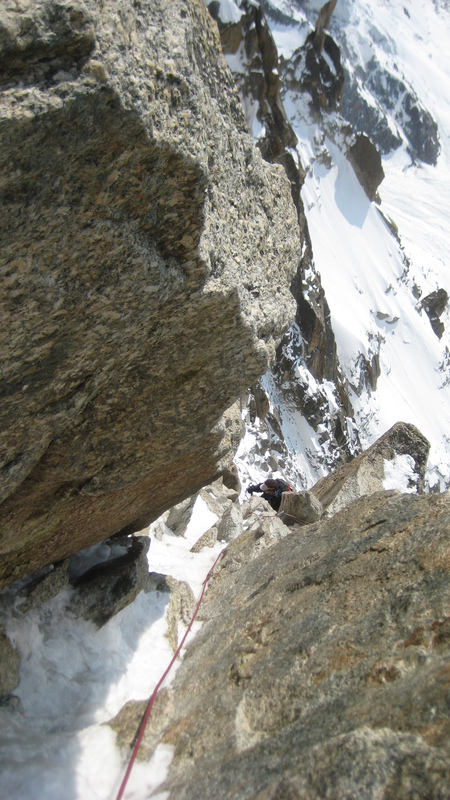 It was still great weather up high so I teamed up with Owen to finally get round to climbing the Cosmiques Arete. 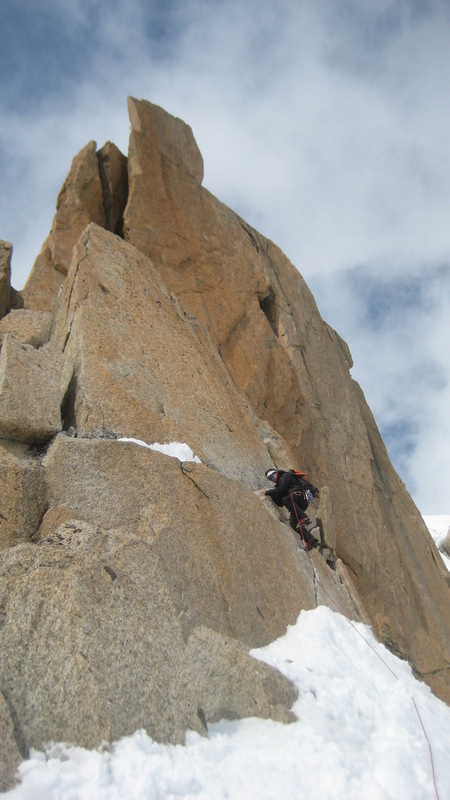 This is a very popular route and is so easily accessible from the Aiguille du Midi lift. 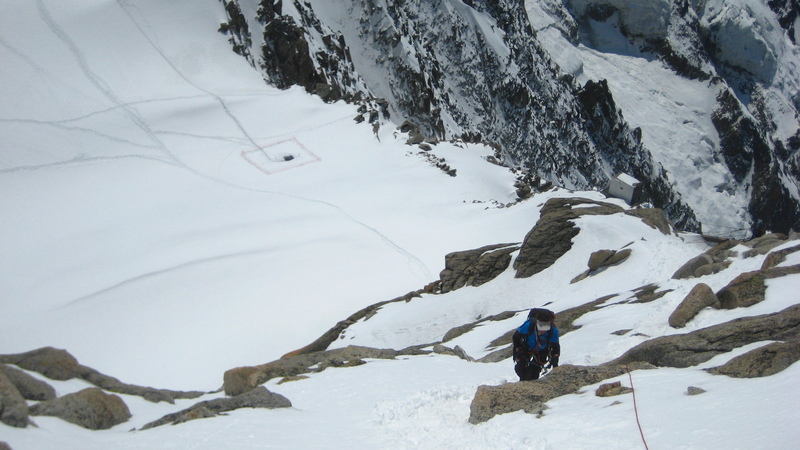 This route is a round trip from the Aiguille du midi, down the east ridge and back up the west ridge back to the top station. The guide book says allow 45mins for the approach and 2-3 hours climbing. we did the whole thing in 3 hours, which wasn’t that bad as we did meet a couple of teams, stopped for a sandwich and placed a lot of gear pitching a few of the sections. 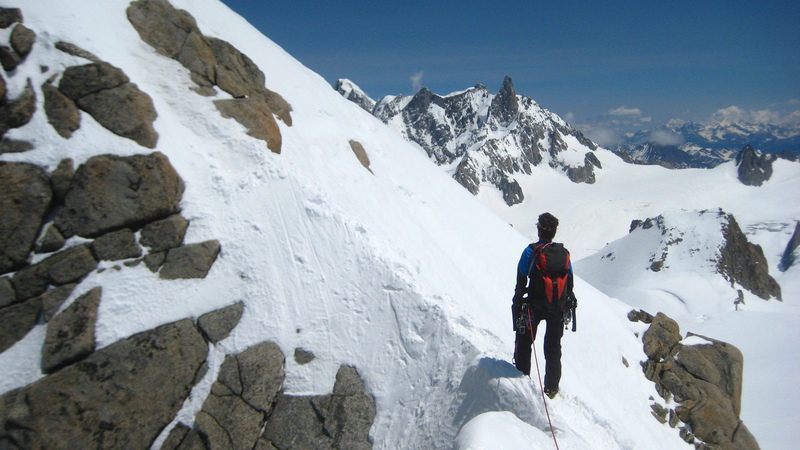 The climb starts next to the Cosmiques refuge on the obvious rock and snow ridge leading back up to the Aiguille du Midi. The route was very well travelled so the path was easy to find. Owen starting up the first snow and rock slopes from the Cosmiques refuge. There was plenty of places to place gear on this initial slope, it is not essential but the snow was getting very soft by this time, 1:30pm, and we felt safer with some gear in. There are some very exposed ridges and some great views on offer. After the first small summit there is a small 20/30m rappel, there is a bolted belay so the rap is fine and quick to set up. It is awkward as there are a few steps on the rappel that you have to climb over with the rope still in your hand. 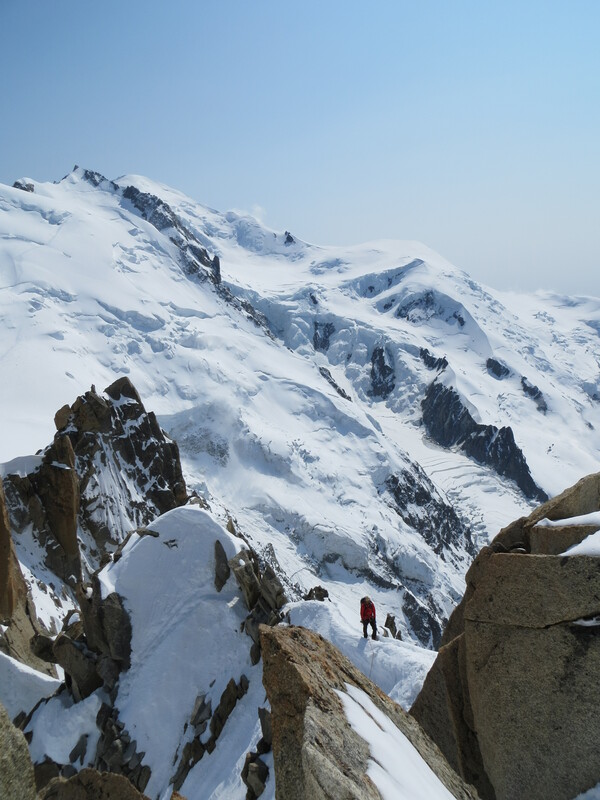 Following the obvious route you come back around onto the south face then start to climb again back up to the west ridge, this section is also exposed but once again you are rewarded with some great views back down the Chamonix valley and with Mont Blanc behind. 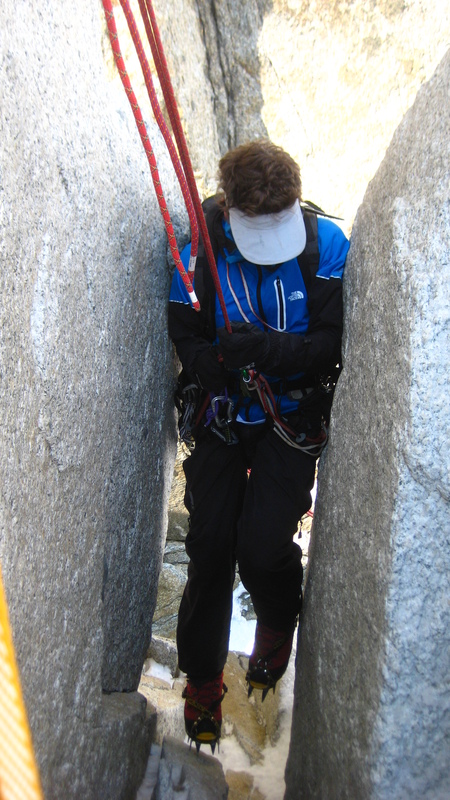 The second rappel is a little trickier, you have to sit in a difficult position to set it up then squeeze yourself through this narrow hole to get down, a prussik is advisable, as you need two hands sometimes! Owen climbing up the first of the rock crux’s, there are some big foot holes, there are two bolts just above Owen and we set up a belay from here to pitch the next couple of moves. 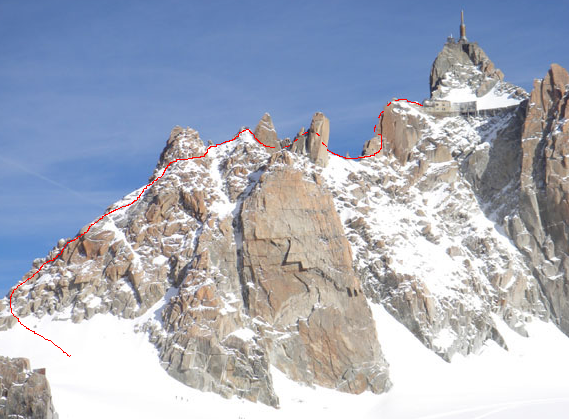 After a short very exposed traverse you reach the final chimney that leads you to the viewing platform of the Aiguille du Midi. 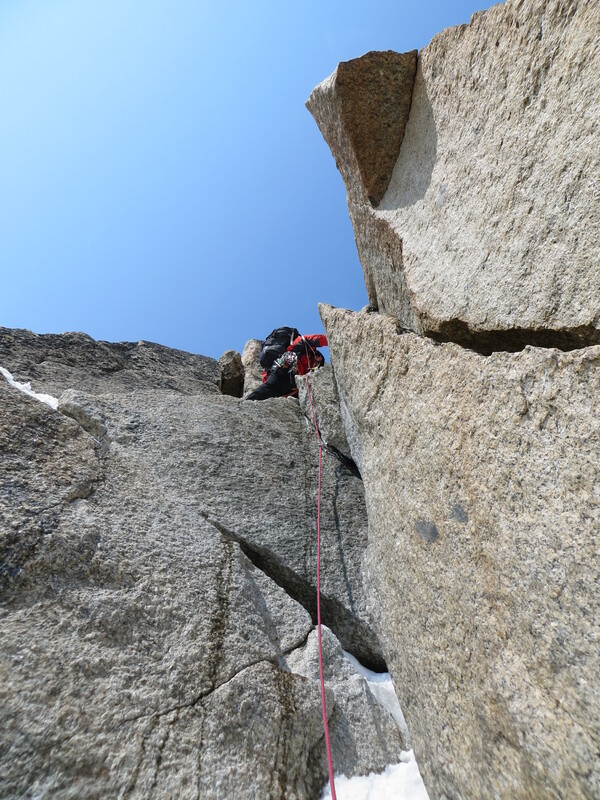 This was the highlight of the climb, nice mixed climbing with plenty of places for gear. 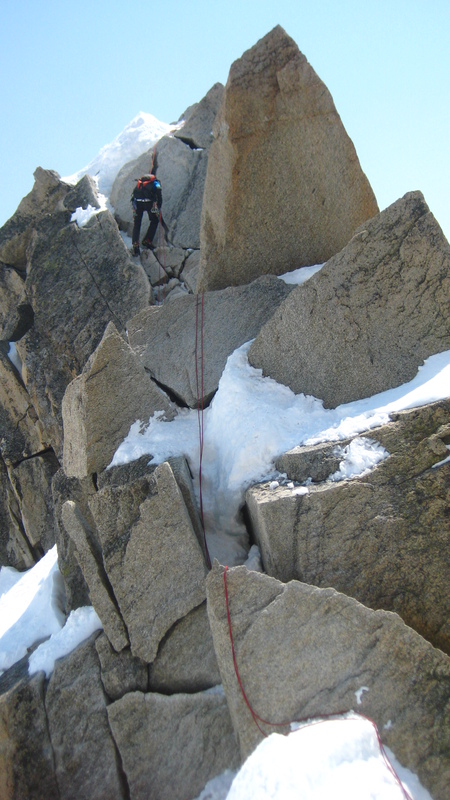 It is a challenge climbing with crampons on and is harder than rock boots, you have to rely on your points and trust they will hold! Looking back down the exit chimney at Owen, he was very hot at this point after deciding to put his down jacket on for some reason! After climbing back up the ladder to the viewing platform you are done and can walk straight back to the lift que. 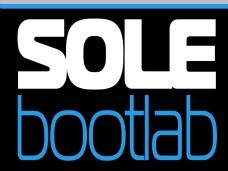 A classic route that was great fun, will definitely be doing it again.